As shovel-making led the industry of Easton in 1852, so textile manufacturing led the commerce of nearby Fall River. Surely, some of the cloth that Evelina cut and sewed came from the busy textile center that lay about 25 miles to her south. Fall River is situated at the mouth of the Taunton River, the head of Mount Hope Bay, and (before the construction of the modern interstate put it underground) alongside the swiftly flowing Quequechan River, whose steep drop gave Fall River its name as well as the power to run the mills that lined its banks. Considered “the best tidewater privilege in southern New England,”* Fall River was an important industrial entity for much of the 1800’s. Bustling with bales of cotton and bolts of printed cloth, the city was accessed at mid-century by the Old Colony Railroad line and the Fall River Steamship Line, two entities that would soon merge. The work force employed to support this industry consisted mostly of immigrants, initially Irish and, after the Civil War, Portuguese. They needed a place to live and a place to worship. The former was supplied by triple-decker tenements, the latter by a succession of churches. 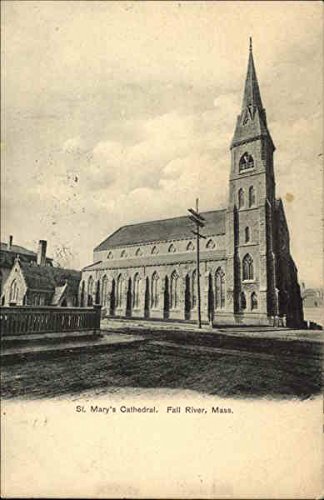 The Catholics quickly outgrew the first church built for them in 1840 and thus on this date in 1852, a cornerstone was laid for a new, major church for the congregation. By December, 1855, The Cathedral of St. Mary of the Assumption was duly consecrated and opened for worship. In 1983, St Mary’s was added to the National Register of Historic Places. We might wonder if any Catholics or others from Easton ever visited St. Mary’s. We can be pretty sure that Evelina and her family never darkened its threshold. On this day, of course, they attended their own Unitarian Church and listened to their beloved Reverend Whitwell.